Scientific Name(s): Coprinus comatus (O.F. Müll. ex Fr.) Pers. Tom Volk covered shaggy manes as his Fungus of the Month for May 2004, so I’m going to refer you to his site to read about some of the science behind this fungus, one of the previous “Foolproof Four”. 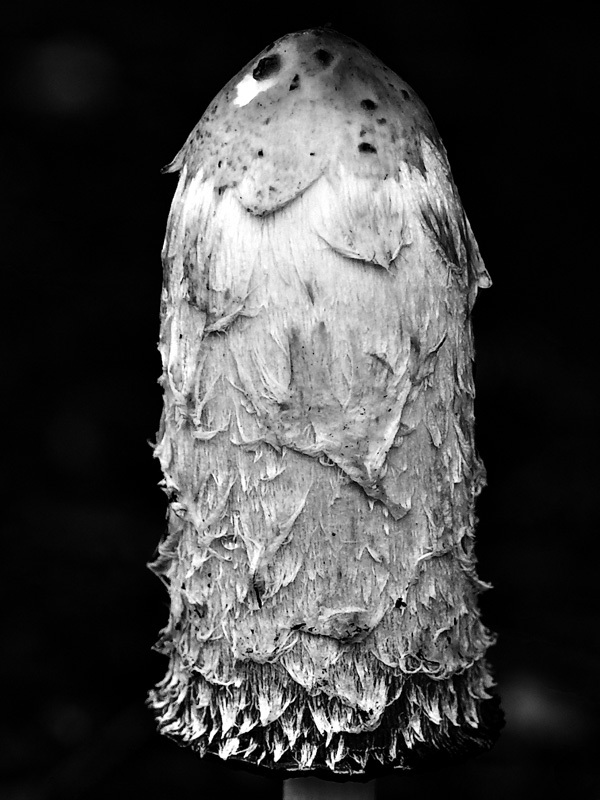 I do have to share one term with you regarding the genus Coprinus: autodeliquescence (doesn’t that roll off the tongue? ), or self-digestion. These fungi break down their own tissue as a way to aid release of spores. Dr. Volk goes into more detail on the phenomenon. You can also read more about Coprinus comatus via MykoWeb or see the original non-close-up image of this photograph on the UBC forums. If you haven’t read the comments from yesterday’s entry, I’d encourage you to do so. Peter Wharton shared his recollections about the expedition where he collected the seed for the Gleditsia, adding a personal touch. Also, Victoria Weber posed some interesting questions about plant taxonomy, which I had to think about how best to address. I’ve come to the conclusion that since I can’t think of a site that answers her questions compactly, I’ll answer them over time within BPotD entries. I can then collate the writings and publish it somehow as a separate article on the garden’s web site or journal. Does this approach work for you, Victoria? I know it’s not an immediate answer. Photography resource link: Mark Hobson’s article on Book Publishing (via Nature Photographers Online). I might also add that it’s a good time to look for C. comatus. We’ve just had two weeks of rainy weather (here in Washington), and the Shaggy Manes are usually some of the first mushrooms to pop up. With their tall, shaggy, columnar caps,they’re easy to spot, especially in urban areas: just start looking around empty lots, sides of roads, curb plantings, lawns, etc. A couple of years ago, I found dozens of them clustered around the base of an electric bank sign. It is interesting that the term (auto-) deliquescence comes up here. In teaching about plant identification, we use the term deliquescent (a gradual melting away) to describe the branching pattern of many deciduous trees (compare with the term “excurrent”; i.e., with a central leader and more or less horizontal secondary branches, like a Christmas tree). A somewhat more metaphorical use of deliquescent, but ultimately, less gooey. A “gradual melting away” is a good way to describe what happens to most mushrooms in the genus Coprinus. If you’ve ever seen one in the middle of auto-deliquescence, you won’t forget it. Often times, I encounter just tattered remnants after the process- tall stalks mounted by stringy, spider-like blackish shreds. Thanks Matt – indeed, it is the time of year. This photo was from this time last year (Oct. 10), taken just a few steps outside of the garden’s admin building at @ 100m above the Strait of Georgia. I also saw some a week and a half ago in Manning Park on a mountain at @ 1700m.